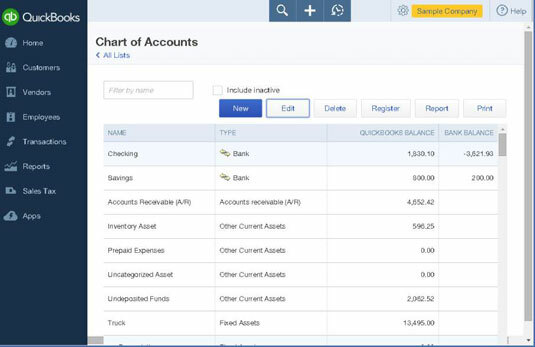 You open a register from the Chart of Accounts page in QuickBooks Online (QBO). 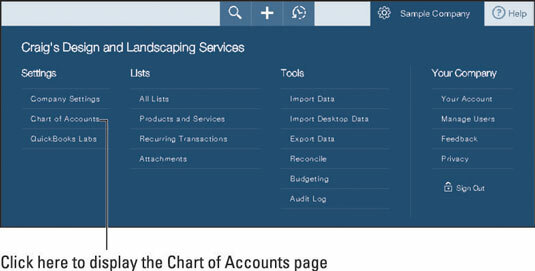 To open the Chart of Accounts page, click the Gear icon beside your company’s name and, from the menu that appears, click Chart of Accounts in the Settings column. From the Chart of Accounts page, you can double-click any account that shows a dollar amount (including 0) in the QuickBooks Balance column; all these accounts are Balance Sheet accounts and have registers. You can click an account to select it. If the Register button above the list of accounts becomes available, then you know you have selected a Balance Sheet account. You can click the Register button to open the account’s register. Click anywhere on an empty line. QBO fills in today’s date and displays a small list box above the date. Click the list box and, from the list that appears, select the type of transaction you want to enter. Before you open the list box, a title of a transaction type appears. After you open the list box, QBO displays the list of available transaction types and, in the process, covers up the transaction date; that’s why you can’t see the transaction date for the transaction here. 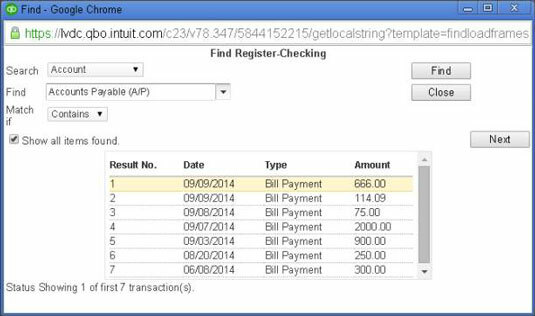 When you open the list of transaction types, QBO displays only those types of transactions available in the account register you opened. For example, you can record a customer payment in a bank account register, but you cannot enter a customer invoice. Similarly, you can record a check or a bill payment in a bank account register, but you cannot enter a vendor bill. Press Tab and, if necessary, change the transaction date. Press Tab and, if appropriate, supply a reference number for the transaction. For example, if you’re recording a check, supply the check number. Press Tab and supply a name. For example, if you’re recording a payment you received from a customer, select the customer’s name. If you’re writing a check, provide the payee’s name. In the appropriate column, provide the amount of the transaction. In a bank account register, record a payment you’re making in the first dollar amount column and an amount you’re depositing in the second dollar amount column. QBO’s placement of the insertion point depends on the type of transaction you’re entering. For example, if you’re entering a Received Payment, a Bill Payment, or a Refund transaction, QBO places the insertion point in the Memo column, where you can type a memo for the transaction. If, however, you’re entering a Check, a Deposit, a Sales Receipt, a Cash Purchase, an Expense, a Transfer, or a Journal Entry transaction, QBO places the insertion point in the Account column. Select the other account (in addition to the account whose register you have opened) affected by the transaction. For example, if you’re entering a check, select an expense account. If you enter an account and press Tab, you can enter a memo for the transaction. Press Tab and then click the Save button that appears just below the transaction. You can edit a transaction from a register by clicking the transaction and then clicking the Edit button that appears below the transaction. However, you don’t edit the transaction in the register. Instead, QBO automatically opens the transaction window for the type of transaction you selected. 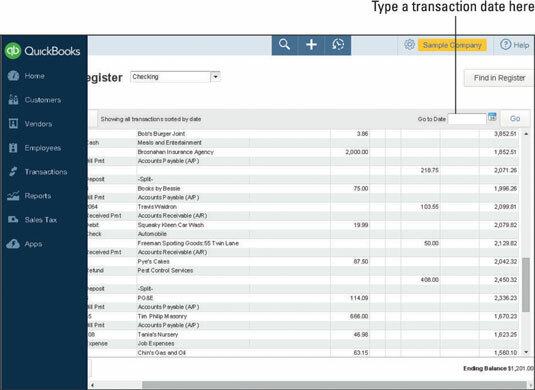 For example, if you opt to edit an Expense transaction in an account register, QBO displays the transaction in the Expense Transactions page. After a while, the number of transactions in a register can get very long, especially in a bank account register. So, looking for a transaction by skimming through the register — or eyeballing — can become a nonproductive way of finding a transaction. Instead, you can use a couple of shortcuts to help you find a particular transaction. Sort the transactions by date, reference number, amount (ascending or descending), reconciliation status, or creation date. Filter the transactions displayed by reconciliation status. Show each transaction on only one register line rather than two lines. This figure focuses on the right side of the register page. Notice the Go to Date box; you can type a transaction date and click the Go button to the right of the Go to Date box to quickly view transactions beginning with that date. In addition, you can click the Find in Register button that appears in the upper right corner of the register page. 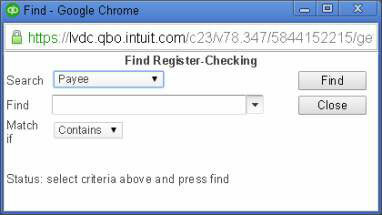 When you click Find in Register, QBO displays the Find Register dialog box. From this dialog box, you can search by payee, account, amount, reference number, date, memo, or transaction type. After you select one of these choices from the Search list box, make a selection or type what you want to find in the Find box. Then, use the Match If list box to specify whether the transactions QBO finds should exactly match, contain, be greater than, or be less than the information you supplied in the Find box. Finally, click the Find button, and QBO displays a list of transactions that match your search criteria. 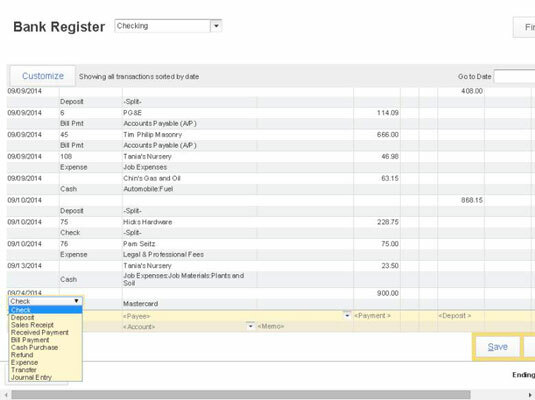 In the background, behind the Find Register window, QBO opens the first transaction in the list in the transaction window in which it was created. For example, if the first transaction in the list is a bill payment, then QBO opens the Bill Payment transaction window and displays the details of that first transaction found as a result of your search.